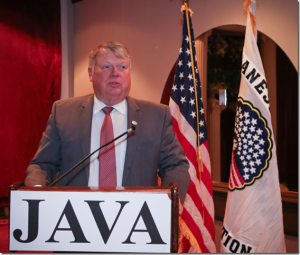 Member of Virginia State Legislature and Asian American News Executive Speak at JAVA Quarterly Luncheon. Falls Church, Virginia. 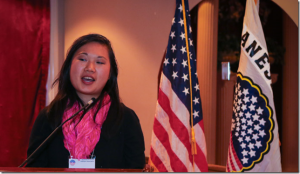 Delegate L. Scott Lingamfelter, a member of Virginia House of Delegates, and Jenny Chen, editor-in-chief at Asian Fortune newsmagazine, addressed the Japanese American Veterans Association (JAVA) quarterly luncheon held at the Harvest Moon Restaurant at Falls Church, Virginia on October 25, 2014. Delegate Lingamfelter, who represents parts of Virginia’s Fauquier and Prince William counties and is a retired Army Colonel, described his sponsorship of a House Resolution entitled “Celebrating the life of Robert Nakamoto.” Nakamoto was recognized for his contribution to Virginia’s economy via his firm, Base Technologies, and his leadership in various civic organizations. A history enthusiast, Lingamfelter described heroism during a battle in the Normandy Invasion and highlighted the service and decorations of the 100th Infantry Battalion and the 442nd Regimental Combat Team. He ended by saying that these collective actions and efforts demonstrated the spirit that makes the United States a great country. He met two World War II Nisei veterans who were present. Jenny Chen, editor-in-chief of Asian Fortune newsmagazine, spoke about the importance of stories and storytelling. She talked about her experiences as an Asian American and how her work as a journalist and multimedia producer have introduced her to many stories that have affected her life. She said that stories have a huge potential to touch peoples’ hearts and change their perspectives. Chen urged members of JAVA to think about their stories and offer their experiences and perspectives to the community. Yamada also said the 2014 Veterans Day Program will also feature Professor Neal Katyal, former Acting Solicitor General of the United States, as the keynote speaker. Katyal will discuss the Solicitor General of the United States withholding of key information from the US Supreme Court pertaining to the Korematsu and Hirabayashi court cases.